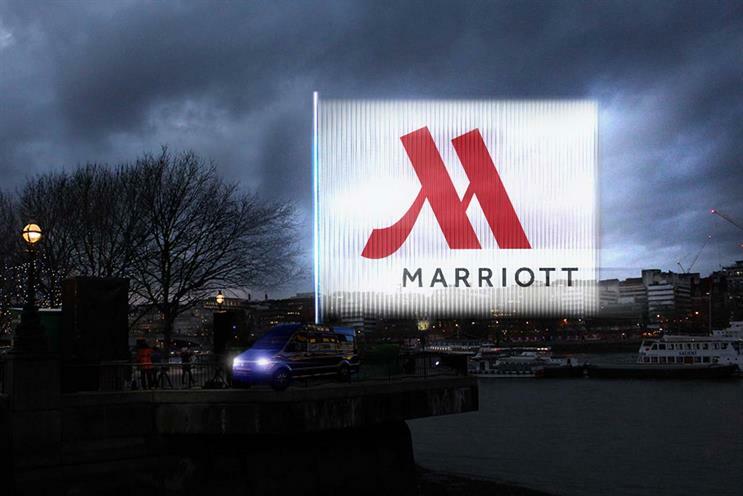 Marriott Hotels is today launching the world's first campaign using Echo, a projection technology from UK start-up Lightvert, which creates the optical illusion of images projected into the night sky. The technology uses a projector to "print" a series of vertical lines of light on the eye of an observer that appears to become a complete image, thanks to the "persistence of vision" effect. Starting at 4pm today (21 December) on London’s South Bank and running for three days, Marriott will "project" images of the Eiffel tower and Rome's Colosseum as part of the brand’s "Travel brilliantly" campaign. Passers-by will see the images appear over the Thames, if they look from the right place. The display can be found at Observation Point, just next to ITV Studios and halfway between the Oxo Tower and the National Theatre. Alongside the display, there will be festive music and a hot chestnut cart. The campaign was co-ordinated by Kinetic in association with Marriott's media agency Wavemaker. Kinetic has a partnership with Lightvert, along with other start-ups, as part of its technology incubator, KineticX. John Licence, vice-president premium and select brands Europe at Marriott International, said: "We wanted to bring a magical new experience to London this Christmas and this campaign does exactly that by mixing cutting-edge technology with iconic imagery of beautiful landmarks that will appeal to anyone with a sense of wanderlust. Rosh Singh, director of digital innovation at Kinetic, added: "Lightvert’s Echo technology is a real glimpse into the future, bringing something very special to audiences on the move and taking out-of-home to a completely new level for advertisers." If it's still unclear how it works, this promotional video attempts to demonstrate the technology.